Hi everyone - it's time for our final challenge of 2017 - the Group Project! Below are links to a puzzle-piece. This is what it looks like, and you can copy it from here or use one of the links to download a file. We're not really making a jigsaw, but the shape means that our individual artworks will fit together. The idea is to each fill the puzzle piece with anything at all - a drawing, colours, patterns, a portrait - whatever you like. Either as digital art or print it off and fill it with traditional drawing or painting - it's all good. Post your completed puzzle piece to the community when it's done, and when we do the Roundup list, we'll also post all the pieces fitted together into one overall Group Project. We're not trying to make a coherent overall picture so the variety of the different works will be interesting. 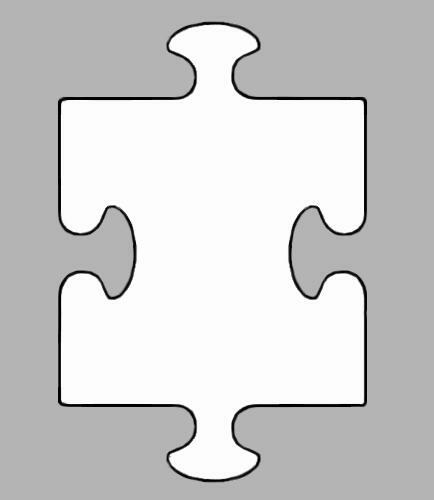 You can turn the puzzle piece on its side as well, as some pieces will need to fit in that way. The gray area is just to remind you to keep your art to the inside of the puzzle piece, as the outer part will be deleted when we combine them all. You can get rid of the gray if you like - or one download option has a white background. Depending on how many people take part we'll probably have to make each piece a little smaller for the final combined work, so that it's not too huge. We'll figure that out when we get there. \o/ Looking forward to it! This sounds fun! Is there a theme of some sort? I know exactly what to draw -- now to draw it. this is such a busy month! But I so want to participate in this! Good to hear - eggs you on! 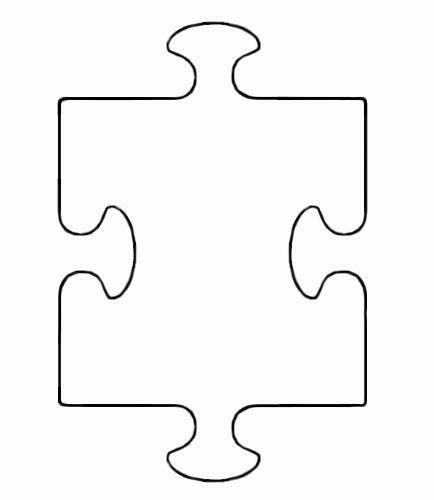 Hey since I will work in traditional media, so I print the puzzle piece as an outline. Do I have to keep the size or could I work on a bigger format? I really want to do something in watercolour but I can’ print on that paper, it’s too thick. I’m thinking of copying the puzzle piece in a bigger format onto the paper. How large should the resized (after scanning) piece be so it fits? You can certainly increase the size so as to do your individual piece. Just keep the proportions the same. If you need help making the shape larger proportionally, let me know - I guess you could trace the shape or use a DIY lightbox to get it onto watercolour paper. But remember that we’ll have to shrink your finished piece down again to be max. the size it is at the moment, so they’re all the same size when we combine them, so if there are very small details they might get lost in the combined work. Guys I made such a dumb mistake. I just finished my puzzle piece, wanted to admire that the watercolour did what it was supposed to do.... and then,.. noticed that I forgot the e from the community name (which I put very prominently in the middle). Argh I want to kick myself! Oh and btw, did you mean that we have to cut out the puzzle piece form before we post or could I leave it as a square and you’ll do it anyway when you fit them all together? Great that's a relief because I don't know of any simple way to cut out such a shape with my graphics program (there probably is one).